Max output 75W, supports VW/Bypass/TC-Ni/TC-Ti/TC-SS/TCR Mode. 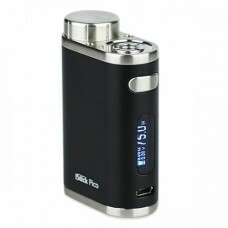 It features replaceable single 18650 Cell and compact size. 5 colors for your selection. Vaping: Long press the fire button and take a puff. Stealth function: While the device is on, simultaneously hold the fire button and the down button. This will allow you to switch between the Stealth on and off function. Lock/unlock: While the device is on, simultaneously keep pressing up and down buttons for 2 seconds. This will allow to switch between lock and unlock. Switch the display Mode: While the device is powered off, keep pressing up and down buttons simultaneously for 2 seconds, the display will rotate 180 degrees. Shift between VW/Bypass/TC-Ni/TC-Ti/TC-SS/TCR mode: While the device is on, press the fire button 3 times in quick succession, the first row will flash to indicate you entering the menu. Press the up or down button to switch between different modes. Then press the fire button one time to confirm the mode you chose.